A free hardcover book, or a free pie. This is a tale of two promotions. Brother against brother. Who will win? We thought it would be fun to look at the email click through rates for each campaign and see which one came out on top. I know the suspense is probably killing you right about now so i’ll cut to the chase. We kicked off a free giveaway via our newsletter in August and for the first prize – we partnered with another client (and local eatery) Cootie Browns of Johnson CIty and offered one of their fabulous Key Lime Pies. If you are from around here, you know that people pretty serious about this dessert. It’s a local favorite. We had a great response and actually gave away TWO pies because we had a tie for the winners. 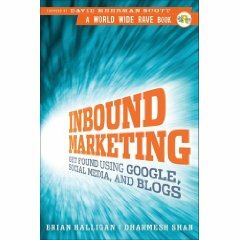 For our next promotion – we gave away a hardcover edition of the super-awesome book “Inbound Marketing” by Brian Halligen, Dharmesh Shah and David Meerman Scott. Fantastic book – by some really heavy hitters in the Inbound Marketing industry. As Hubspot Partners, we’re really into this Inbound Marketing stuff (obviously). So what are some take-aways here? Eating too much pie might make you fat. Reading too much information about inbound marketing might make your wallet fat!. Eat less pie and read more about Inbound Marketing 🙂 Seriously though – the big take-away here is to ALWAYS examine the results of any marketing event and compare to others. Build upon what works and trim what doesn’t. Even though this was written somewhat as a joke – there is a lot to be learned by A/B analysis of any sort of advertising. As Hubspot Partners, we aren’t only consultants that sell Inbound Marketing services, we also apply the same principles and use the same software with our own business. Because of that, we love to break down the statistics after a promotion to see what works and what doesn’t. In fact, how do we know that Inbound Marketing works? Because the folks that developed Hubspot also like to break down the stats after every marketing action. Hubspot was developed in 2006 and the really fascinating thing is that every best practice, every piece of advice and every feature of the software is based off of years of benchmarking and studying what works compared to what doesn’t. The craft is constantly being honed and the tools are always being tested, compared and made better. The entire inbound marketing principle is based on three words – Attract, Convert and Analyze. Make sure you are doing all three! For more information about inbound marketing, check out the free whitepaper below!